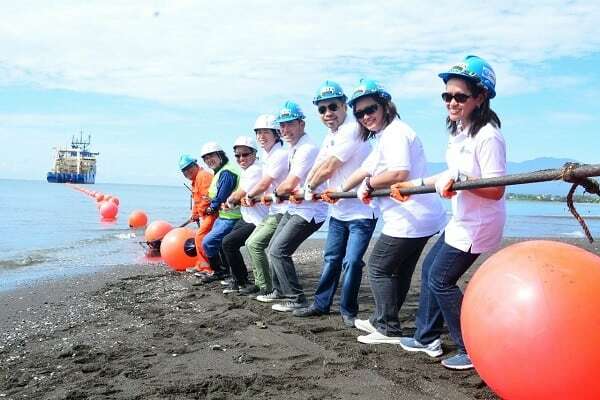 Globe Telecom successfully landed over the weekend the Southeast Asia-United States (SEA-US) submarine cable system, bringing the company one step closer towards the provision of richer and enhanced international connectivity to businesses in Davao and the rest of the country. “The primary source of information now for many people is the internet so the city government of Davao is very happy with this development. This will definitely benefit Davao City especially the service sector such as Business Process Outsourcing and Banking and Finance as well as the whole Philippines. Thank you very much for the trust you placed in Davao’s local government and for choosing Davao as a place to invest in,” said Davao Councilor Bernard Al-ag who represented City Mayor Sara Duterte during the cable landing ceremony. The SEA-US cable system consortium in which Globe is a part of, will link five areas and territories that include Manado (Indonesia), Davao (Philippines), Piti (Guam), Oahu (Hawaii, United States), and Los Angeles (California, United States). At a project cost of around US$250 million, the 14,000-kilometer cable system will consist of two fiber pairs with an initial design capacity of 20 terabits per second and will use the latest in submarine fiber-optic technology with 100 gigabits per second transmission equipment per pair. Such additional capacity will cater to the exponential growth of bandwidth between Southeast Asia and the United States. In addition to this initiative, the Globe Business Davao Data Center, which is linked to the SEA-US cable system, will cater to BPOs, financial institutions, Internet service providers and other content providers in southern Philippines. The project, once completed, will address ICT requirements of major trade and industry centers in Mindanao region. Aside from forming part of the SEA-US consortium, Globe is also a member of an international consortium of telecommunications and technology companies operating the Southeast Asia-Japan Cable (SJC) system. SJC is an 8,900-kilometer cable system linking seven territories that include Brunei, mainland China, Hong Kong, Japan, Singapore and the Philippines, including the option to link with Thailand. The cable infrastructure is currently being upgraded to bring an increase of 6.5 Tb/s capacity with state of the art 100G technology. Globe Telecom has also made investments in the East Asia Cable system (EAC), Asia Pacific Cable Network-2 (APCN2), Tata Global Network–Intra Asia cable system (TGN-IA), the City to City cable system (C2C) and is interconnected with major Trans-Pacific Cable systems, which encompasses the Unity, Tata Global Network-Pacific, (TGN-P) and the Japan-US Cable Network (U-US). © BigMikesWorld.com | All rights reserved.